Five aluminum rollers on bronze bearings allow cable to make a gradual 90° turn for easy pulling through manhole opening. Has a pulling radius of 12" (305 mm). Two non-metallic “keeper” rollers to hold the cable in place during the pull. Lightweight corrosion resistant aluminum side plates. 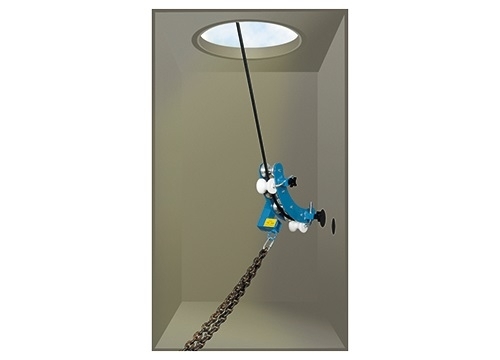 Can be suspended in the manhole or hung on an overhead pole for easy pulls. 3⁄4" (19 mm) maximum cable diameter (consult cable manufacturer for minimum bend radius). 800 lbs. (3,558 N) cable tension load capacity. Replacement Sheaves available. See Specifications and Selection Charts on page 113.